Despite losing to the Chevrolet Camaro ZL1 in just about every road course match up, it would seem that the 650 horsepower Ford Mustang Shelby GT500 beat the ZL1 perhaps where it matters the most — the Nürburgring. At least unofficially. 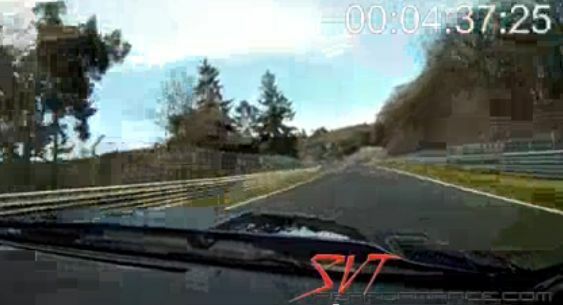 In the video below, we see the GT500 bouncing, throttling, skidding, yelling and just downright fighting to crack the ZL1’s mark of 7:41:2, and it does so with a recorded time of 7:39:28. The time has not been confirmed by Ford yet, although the footage is official. Until Ford proves otherwise, there’s suspicion of the lap time being a little off, as the clock doesn’t really start until just before turn 1. But you can judge for yourself by watching. Even if the Shelby GT500’s time is authentic, the Chevrolet camp still has the last laugh, with the 2014 Camaro Z/28 reportedly running a 7:31.9 when the cameras weren’t filming the damp run of 7:37.41. Next story Can We Please Stop With The Three-Row Cadillac Reports Already? Does Ford think the blue wall is some sort of handicap? Mustang fanboys don’t get too excited, it accounts for about 4.5 aligators. Still, not bad, just not enough! Also note that that is video timecode, not the best form of time keeping. Please do not buy into to this. SVT and Ford are not giving full discloser. Note there is no real info on the car and they fully do not disclose what the car was running and how it was tunes. Second do you really think if this was a legitimate time with a fully stock car Ford would just be sitting on this. Ford is doing what many politicians do and cloud or do not fully disclose the whole truth in hopes it would distract from the real truth. To qualify this keep in mind Ford also has been caught fudging HP number too so they are not always honest. GM on the other hand under estimates their HP and will not claim times at the ring unless they can prove it. you know im always skeptical when it comes to disputes on lap times but wow this one is so far off its ridiculous. just jump to the end and look where they stop the time and then go back to the beginning where they start the time. probably off by a few hundred meters. which would equate to probably 3 or 4 seconds around the corner. this is without a doubt not accurate at all. I set a countdown timer at 7:41 and started it at the Start/Finish line. It ran out when the ‘stang turned on to the short straight leading to the line. I hope that Ford doesn’t go hog wild and rave about this. It amounts to “if you like your health care coverage, you can keep it.” Just completely misleading. So simple a concept to start and stop a stopwatch at the same point. Maybe someone can sync both videos and see the difference. The timer did start after the blue wall and ended at the start/finish line. The only place I see the Ford would have an advantage would be in the long stretch towards the end of the track with all that horsepower. Those tires were not happy, and I don’t think it could do many laps, the brakes would not last. That timer is clearly off by at least 2 full seconds. Even the timing of the YouTube counter is about 10 seconds before the lap even started and that was around just 1 corner. Not trying to be a Ford fanboy but I just watched the ZL1 and GT500 video back to back about 4 times. They start and stop at the same place. I thought I was going to die over and over again!!!!!!! I am just glad the driver made it to the finish line. The Ford Mustang needs to be corralled before someone gets hurt, Ford should focus more on staying on a straight track. Mustang is fast, It just doesn’t compare to the ZL1 or Z28 technology. Facts are Facts. watch the videos. As far as the clock starting…….talk about delay start…….too much German beer cause that. Happy hour starts at 5;00 guys and after work not before , right?? Lets just qualify this another way. The GT 500 has been tested against the Camaro at several other tracks. It has been well documented and stated the conditions and the tunes of the cars. To this point the GT has not been a winner vs. the ZL1. The suspension has been a Mustang sore point and if it has not been a winner in these other test I suspect there is something left out here. It is easy to turn up the boost if needed or add super sticky track tires. Ford has no full disclosure. Now a new Mustang may have something more as it will have a lot of power and a new suspension with less weight. It may get them by for a while. Keep in mind the Camaro is coming on the Alpha and we already know what the TT V6 will do so you can only imagine the Corvette engine and future CTS V engine will do in a Alpha tuned for performance. The Camaro should lose at least 400-500 pounds.